The ancestral house of Gandhi family, where Mahatma Gandhi was born on 2 October 1869 is just adjacent to the Kirti Mandir. 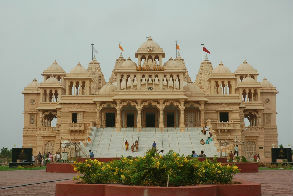 Shri Hari Mandir in Sandipani is situated 5 km from the city of Porbandar, opposite the airport. Shri Hari Mandir, which for many years has been Bhaishri’s genesis, vision and dream has taken 13 years to become a reality. 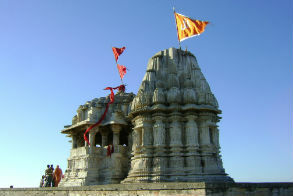 Through the great contribution of a number of experts and overseen by Bhaishri, the temple stands today as one of the grandest and most unique temples of Saurashtra. Chowpatty beach has become hot destination for tourists as well as locals who thronged here in a big number on every Sunday. It’s on walking distance from Porbandar city area. The scenic beauty of this place is mesmerizing. The panoramic view from here gives you glance of many boats and ships floating in the sea. Not to mention the lightning glimpse of sea port from here during night hours will take your eyes captivating. 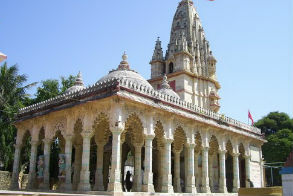 Sudama Temple is one of the revered sites of Gujarat. This temple is dedicated to Sudama who was the childhood friend of Lord Krishna. This temple is often visited by thousands of devotees particularly the newly married Rajasthani Kshatriya couples who visit the temple to take the blessing. Located at the centre of Porbandar, it is one exceptional temple in India which is dedicated to this great devotee of Lord Krishna. Sudama Temple was constructed in 1902 and 1907 at the centre of the city. 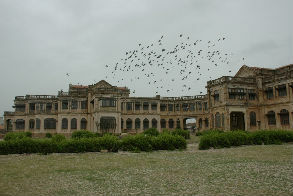 It is one of the historically significant sites in Gujarat. The construction of the temple was hampered to some extend by the depletion of the funds. As the money was less it was raised by collecting donations and organizing dramas to raise the fund. All the rich traders contributed funds which can be used in the construction of the temple. Though the architecture is not too lavish yet it is one of the well-built temples of Porbandar which is often visited by thousands of tourists and devotees. Built with white marble this temple has a number of carved pillars which decorate the temple, open from all sides this temple has a shikhara which is decorated with splendid architecture and carvings. These carvings are also visible above the pillars and the arches which adjoin the pillars. With such architecture this temple is dedicated to the shrine of Sudama which is built in simple structure. This cave is located at Ranavav taluka of Porbandar distirct, near Suarashtra cement factory. 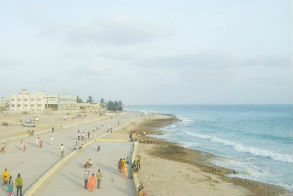 It’s located almost 15 Km away from Porbandar city. This is cave where Jambuvan know worrier of Ramayana age was residing. He was born in satyuga and seen Treta yug and Dwaper waiting for Krishna Avatar. He found diamond of precious value which was given for playing to her daughter Jambuvati. Lord Krishna was in search for same diamond which was taken away from one king by lion and reached to Jambuvan after lion was killed by Jambuvan. Lord Krishna fought with Jambuvan and ultimately him cam e to know that Krishna is nothing but same Lord Ram. He bowed to Lord and given away diamond and her doughter to Krishna with marriage with him. This jambuvan cave is situated near Ranavav town in Porbander district in Gujarat state India. There is deep cave and small light source of sun. Inside there is Shiv ling made by sand when water falls from roof of cave. We can see nature carving too. 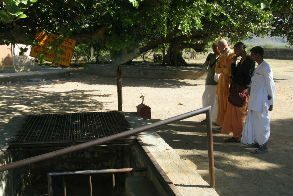 Outside cave there is Lord Shiva temple and Samadhi of Guru Ramdasji who did Tapsya there. Huzoor Palace built by last ruler of Princely State of Probandar, Rana Natwarsinhji, in early 20th century, stands near sea shore at Marine Drive in city. Though, the entry inside the palace is barred for commoners/ tourists. Harsidhhi, a contracted form or, at its very least, a form of “Harshad Amba” – The Happy Mother, is considered one of the aspect of Amba and Kalika, the Hindu Devi. She is also known by the names like Harshal, Harshad, Harshat Shikotar, Sikotar Momai and Vahanvati Mata. 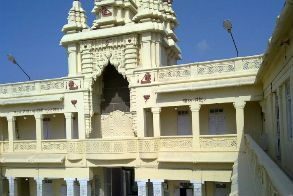 Harshidhhi Mata Temple also known as Harshal Mata Temple located at a place called Miani, some 30 km away from Porbandar en route to Dwarka. The main temple was originally located on a hill top facing the sea.